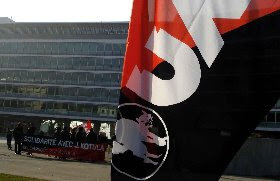 On Friday January 9, members of FAU Switerzland held a solidarity picket at Nestle HQ in Vevey in solidarity with Jacek Kotula, who was illegally fired in September from Alima-Gerber in Poland. ZSP Warsaw will hold a similar picket at Nestle HQ in Poland on Friday January 16. These pickets come before Mr. Kotula's next day in labour court, on January 19 and are meant to show the company that we do not forget about his case, nor do we forget about the repression of unionists that is so common in the Nestle corporation. was dismissed on the basis of art. 52 of the Labour Code, despite the fact that he was protected by law. This is an attempt do intimidate and to gag unionists in your company. different issues relating to the violation of the Labour Code, ranging from unpaid overtime work, work in dangerous conditions and mobbing at work. The reasons for dismissing Mr. Kotula seem like a convenient pretext to get rid of this unionist. We are also aware that the company had been trying to hinder Mr. Kotula's union activity in the past. We demand that Alima Gerber and Nestle stop it's anti-union activity and reinstate Mr. Kotula immediately.